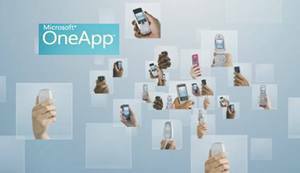 OneApp is a mobile application from Microsoft which allows the users to easily access all of their mobile apps. The OneApp has been designed to target at the feature phones users who like to enjoy social site. OneApp has been integrated with applications like Windows Live Messager, Facebook, Twitter, News, Reader, Sports, Stock, Games and etc. The users able to customize their mobile by launches just the parts of an app which they want to use and all the applications can be access from one place without to visit several sites. Feature phone typically lacks the powerful capabilities of standard smartphone. Due to the limited memory and processing capabilities of feature phone, OneApp has been designed as a lightweight on-phone with footprint of just 150KB that makes the installation easy and fast. In addition, it also includes cloud services that help offload processing and storage from phone to the Internet as well as improving overall performance. Nokia – 3555, 5320, 6300, 6500, 6600, E50, E51, E63, E65, E66, E71, N70, N72, N73, N78, N80, N81, N82, N85, N95 and N96. Sony Ericsson – C510, C902, C905, G705,K610i, K800i, K805i, T650i, W200i, W580i, W595, W660i and W980. mibli, powered by is now available for download in South Africa through Blue Label Telecoms, according to , and Microsoft is expected to launch OneApp in more countries within the next year.